I felt that I should open my historical travels through Busch Gardens the Old Country by beginning in the Hamlet of England. More precisely, I should start with the original show featured in the Globe Theater back in 1975, which would be The Ghosts of the Globe. Granted I wasn’t even conceived when this show first ran, but I was fortunate enough to experience the show first-hand when I was but a wee tike. The show left quite the impression on me as I still recall how much I enjoyed the show; even if I was terrified through most of the performance. Basically the story of Ghosts of the Globe centered on a young girl named Melinda, who wonders into an empty theater. Suddenly she begins seeing visions of fabulous characters that embrace her into the world of Shakespeare until the witch from Macbeth appears along with the creature from the Tempest who both bring forth terrifying special effects that scare poor Melinda (as well as my four year old self). By the end of the story, Melinda finds the courage and kindness to save the day. It was a fun production and the entire performance lasted approximately 40 minutes. I ran into one of the actors who played in Ghosts of the Globe and he mentioned that most of the performance was lip-synced to a prerecorded dialogue and the sound effects and visual effects were quite elaborate for the time. Thank you for your interest and I hope you enjoyed going back to Ghosts of the Globe at Busch Gardens, the Old Country. Feel free to share your experiences or memories of Ghosts of the Globe in the comment section below. Gardens-The Old Country. Screened from Twentieth Century by the Tidewater Woods, its winding cobblestone streets invite visitors to explore over seven centuries of our European heritage. If you wonder through the English Village at The Old Country, some summer afternoon, visit the impressive reconstruction of Shakespeare’s Globe Theater there. It is on the stage of this theater where our story takes place. Or perhaps, we should say Melinda’s story, since she is the name of the very pretty young lady that happens to be the heroine of our tale. And what a strange and marvelous tale it is that begins to unfold when Melinda finds herself alone in a deserted theater. A wandering minstrel that appears out of thin air! A ghostly banquet, attended by ghosts of Shakespeare’s most memorable characters! Here are Sir Andrew Aguecheek and Sir Toby Belch, those clumsy clowns from Twelfth Night. Here is portly King Henry the VIII, and Dame Ford, one of the Merry Wives of Windsor. The job if entertaining the guests falls to Puck, the magical mischief-maker from a Mid-Summer Night’s Dream. And, to Melinda’s delight, she finds Romeo among the guests, still romantic and dashing after nearly four hundred years. Then, just as Melinda is beginning to feel at ease with her ghostly companions, their merry-making is interrupted by the appearance of the witch from Macbeth and Caliban, the slimy monster from the Tempest. Dark sorcery turns the theater into an arena of sinister and terrifying occurrences. Even, Prospero, the kindly wizard from the Tempest, finds it dangerous to oppose these two masters of evil. In the great battle of sorcery that follows, he very nearly falls before Caliban’s power. It is Melinda, herself, with a courageous act of kindness, who finally restores harmony to the spirit world of the Globe and winds the gratitude of the theater’s ghosts. Melinda’s fellow actors laugh at her story of ghosts and demons. A dream, they call it. Nothing more than a young girl’s imagination working overtime. Of course, we know they’re right. Spirits? Sorcery? Mythical Beasts? This is the Twentieth Century! Things like that just don’t happen today. Or . . . do they? I believe you are seeing (Left to Right, Top to Bottom), Caliban, Melinda, Sir Andrew, one Merry Wife of Windsor, and Prospero the Wizard. By noramarien in Shows and Entertainment on January 20, 2013 . Nicely Done! I wish video cameras were readily available then and someone would have documented a performance. Those staues that came alive in the balcony of the globe theatre were just amazing! Everytime I go in to the Globe I look up and remember those days of yonders past. I agree. I was terrified of the witch when I was little! All I have is the LP record and a postcard with images from the show on them. I hope that someone reading this may have other images to share with us. Of course, I remember (in a precise female British accent) that in the “Busch Gardens Globe Theatah” one should note that “During the performance, flash photography is strictly prohibited.” Along with: no eating, drinking, or smoking. I remember this show but not as clearly as you have. I guess my memories are clouded by the loss of the Catapault. Remember when the Catapault was somthing worth waiting in line for? The one and only well theamed scrambler I’ve ever seen. Don’t forget to mention that in the upcoming Hastings/Ireland post. Oh, and Turvey Manor and the shadow wall, the Shooting Gallary (that for some reason had a western piano player in it that if you shot his but played ragtime), Height and Weight (which I always won the weight, I guess I was just too scrawny. ), Reynolds Theater, ect. ect…. Ask and you shall receive! Please visit the link to the BGW Memories Facebook page to see photos of what you are speaking of! 😀 https://www.facebook.com/media/set/?set=a.150002108486643.35212.149401725213348&type=3 I had you in mind when searching for these photos in old souvenir books and other places. Thanks for reading and I will do my best to keep this site updated with new tales and adventures! I, too, remember Ghosts of the Globe very well and I was quite happy to see someone write on it. This show was by far the best show ever put on at BGW from the very talented cast to the great costuming and the incredible special effects (trap doors, etc). Unlike the author of this article, I was a bit older when I first saw the show, like about 19 years older! Nevertheless, a great memory for us slightly older folk. Thanks for the article! I’m glad you enjoyed the article Jim. I would love to put the MP3 version of the record online as I have made digital transfer so I can listen to my record on my PC. However, I would rather get permission from someone first before doing that. As an artist myself, I feel strongly about obtaining the “OK” for something along those lines. I’ll try to research how to obtain the OK for this as I am sure you and so many others would love to hear the show again. If you ever run across any photos or memorabilia you have of Busch Gardens that you would like to share; please contact me. I would love to have a copy of a park map for each year of the par’s operation for example. Thanks again for your response and kind comments! Ran across this post just searching for ANYthing on this old performance. I was just turning 9 years old when I saw this…on vacation in Williamsburg during July 4 week (my birthday is July 7 and we were frequently in Williamsburg on my birthday). My family and I were sitting on the front row and as the actors took their final bow one very handsome young man smiled and winked at me. I can’t tell you who he was or even what he looked like now but I have been in love with him my whole life. 🙂 Thank you for this memory. Bonnie, I adored this story. Please visit the facebook page for BGW Memories to see more photos of the park’s early years through today. I am so glad i could reconnect you to such a wonderful memory. Feel free to contact my Facebook page should you wish to send photos – stories- or anything about the park’s history. Thank you- you made my day. I am thrilled to find this post. 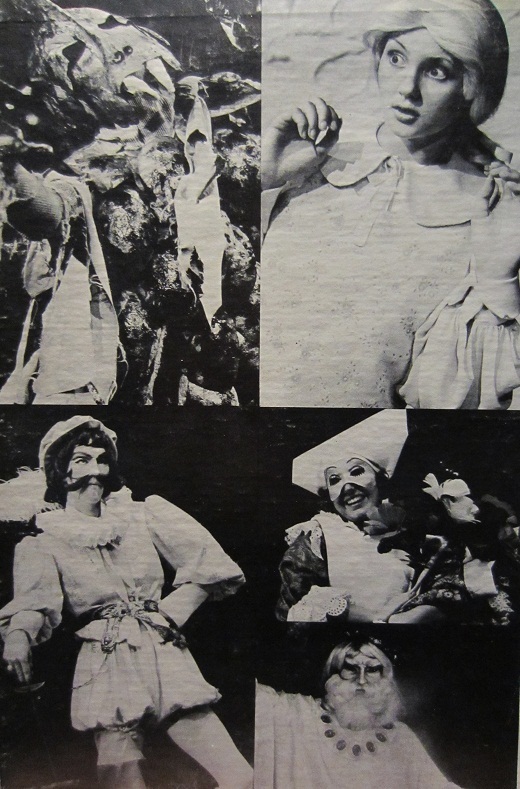 I was Melinda in the 1977 production. I had just graduated high school and was one of the youngest members in the cast comprised mostly of William and Mary theater majors. What an amazing experience! We worked hard, performing 8 shows a day, 6 days a week. On the 7th day our understudies took over. With all the special effects, it was crucial for us to hit our marks precisely. There were times when our equipment or computers failed resulting in very unusual situations: the witch only half melting, set pieces suspended in mid-air, the statues not talking. the best part? My fellow cast members! some of whom are wonderful life long friends. As a matter of fact, I had lunch with Prospero today and we sent our selfie to Caliban and Romeo! when I left to go to college, I had performed 825 shows in one season. Those who stayed to work the weekends performed over a thousand. I continued my theatre career for a while, and now perform at a ComedySportz Improv Theater in Richmond. Thank you so much for this post. I’m very grateful to have had this experience and to be able to relive it here! Your message has made my day! I am thrilled to have the opportunity to both thank for your work at the park and for your kind words about my blog post. It is your life that touches so many as Ghosts of the Globe really sparked my imagination as a kid. I can picture what you mean about the special effects and timing! That witch that was in the balcony always scared me. Have you seen the new live performances in the Globe at Busch? London Rocks (regular season), Monster Stomp (Howl-O-Scream), and Scrooge No More (Christmas Town). The park uses state-of-the-art projectors and special effects to choreographed dance and live vocals. It is amazing what theaters can do these days. I am sure you have an amazing story to tell and should you ever wish to, my blog is here for you to recount your memories at the park. Most people look back at the “Old Country” with great fondness and miss all the traditions that happened while you were working at the park. Any photos or stories you wish to share of your time there would be amazing! 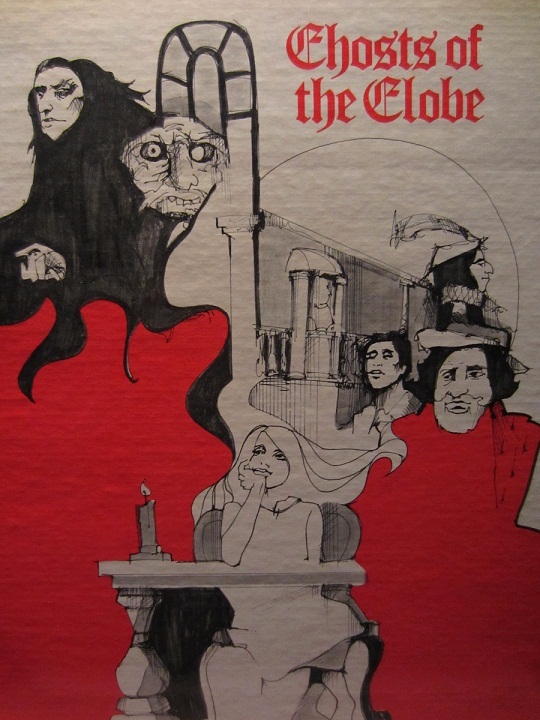 If you like, I would be honored to send you the music from Ghosts of the Globe to share with those who worked there. I’m not sure if you have a copy of it or not. I was not aware there was a third season of Ghosts of the Globe. I thought they had some type of magic show. Having been in the original cast for the first two years, I would have enjoyed seeing the new cast.